TEETER KIN is a genealogical record of many families, to include descendants of Conrad Teeter. -CONRADT TEETER (b GER -d 1771 SUSSEX NJ) married CATHERINE WEBER. -HENRY TEETER 1743 PA -1804 NY married ELIZABETH BEIDELMAN 1748 PA -1804 NY. -CONRAD TEETER 1770 PA -1840 NY married CHRISTINE KELLER 1772 PA -1852 NY. -ANDREW TEETER 1795 PA -1886 NY married *ABEAH HARTSOUGH 1797 -1845 NY (d/o Angelburt/Christiana Owens Hartsough); married 2ndly CAROLINE SENSABAUGH ROAT 1819 NY -94 NY. -GEORGE TEETER 1822 NY -1905 NY married CAROLINE GROVER 1824 NY -1898 NY. -FRANK TEETER 1853 NY -1908 PA married ANGELINE DOLL 1864 PA -1943 NY. -WILLIAM TEETER 1883 NY -1965 NY married ANNA WHITE 1899 NY -1976 NY (my grandparents). Photo above of their 50th wedding anniversary. "MY TEETER KIN" *** consists of three parts: (1) my detailed TEETER lineage; (2) my WHITE/POINTER ancestry; and (3) my BLACK/CURRENT/ROBACKER heritage. Said document has a 1905 historical biography of my great grandfather FRANK BLACK 1863 OH - 1927 CA (RR conductor, So Pacific), grandson of Henry and Susanna Carey Black. "TEETER FOLKS" *** an expansive families outline for those searching their roots, as descendants of CONRADT TEETER. "BEIDELMAN ANCESTRY" *** contributor, Betty Boyle, of PA. Henry Teeter (son of Conrad and Catherine Weber Teeter) married Elizabeth Beidelman (daughter of Jacob and Susannah Hockday Beidelman). "FOLEY LINEAGE" *** contributor, Mrs. Jill (Ed) Foley. Olive Mabel Teeter (daughter of Frank and Angeline Doll Teeter) of Tompkins Co NY married 1917 Thomas Foley. "TEETER KIN NOTES" *** obituary snippets. "MISCELLANEOUS" *** data regarding Frank and Angeline Doll Teeter and their respective families. "JOHN AUNGST OF OHIO, ET AL" *** other kin to include: Crunkilton, Robacker, Black, Current, West, Bresler, etc. 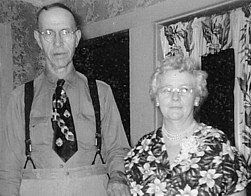 Ophelia Robacker (d/o Sam/Mattie Aungst Robacker) married 1912 Clinton Black who had three children (my line). "THE DUNHAM TREE" *** with two additional files: Deacon John Dunham history; and an expansive Dunham tree. See 1872 photo of John and Wealthy Barber Dunham's male offspring. "FOTOS PLUS" *** contains assorted family photographs, with ancestral histories, to include: Black, Current, West, Robacker, Aungst, Eckerts, Sleichter, and Bresler, as well as Teeter, White, Pointer, Russell, Foley, McIntyre, Callahan, etc. "TEETER TOTS" *** ancestral tidbits. "TEETERBOARD" *** New file per April 2012, where ongoing data unto the whole of Teeter Kin will now be added; even whilst tweaking other files. "GREAT LINKS" *** resourceful databases; and notes. My mottos: "Tree a twig...leaves you rooted." AND "Hoot for Genealogy!" In remembrance of loved ones who rest eternally: "YOUR memory stayeth my lifetime and that of others ~ SORROW follows loved ones passed ~ INDESCRIBABLE, soulful sadness ~ EASED by time, never erased ~ PAINS stilled, void remaining ~ MEMORIES, with courage sustained ~ STRENGTH for life's earthly journey ~ TOWARD a higher spiritual peace ~ WHEREIN, all shall follow." Notice: In considering material abstractions of TEETER KIN, adherence to ethics applies. Respect works of others. DO NOT PLAGIARIZE. Get permissions, denote sources, and give credits, for data you want to use. Certain facts are public; rewriting another's script is mimicry. Disclaimer: TEETER KIN represents research data from many sources; said contents not without error. Rely upon other verifications should there be discrepancy within and of any compilation or record. Current E-MAIL :: Lakeshore32(AT)Twc(DOT)Com :: Laurie S Dunham, your author, and spouse, Nelson :: online presentation since 2003; last updates, April and September 2013; December 2014; update addendum to corrections file; see below); and July 2017 e-mail update. Online for 14 years plus.